Halifax Light Opera Society Juniors are staging this amateur youth production, by arrangement with the Really Useful group, of Joseph and the Amazing Technicolor Dreamcoat at the Halifax Playhouse from February 16-20. The Biblical story of Joseph and his coat of many colors comes to vibrant life in this delightful musical parable. Joseph, his father’s favorite son, is a boy blessed with prophetic dreams. When he is sold into slavery by his jealous brothers and taken to Egypt, Joseph endures a series of adventures in which his spirit and humanity are continually challenged. Set to an engaging cornucopia of musical styles, from country-western and calypso to bubble-gum pop and rock ‘n’ roll, this Old Testament tale emerges both timely and timeless. Tickets, which cost £10, are selling out fast so be sure to book now on 01422 365998.
lThe musical was created by Tim Rice and Andrew Lloyd Webber and played the West End first in 1973 heading to Broadway in 1982. With Jason Donovan in the lead, the expanded show was restaged in 1991 at the London Palladium with Steven Pimlott as director, winning the 1992 Laurence Olivier Award for set design. 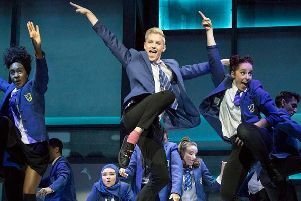 The cast album of this production was top of the UK album charts for two weeks in September 1991, and the single “Any Dream Will Do” for two weeks in June–July 1991.The production has been performed by thousands of schools and amateur theatre groups.